With less than one week left to postmark your order, time is ticking out for your chance to secure some of the best seats for the 2009 DCI World Championships! 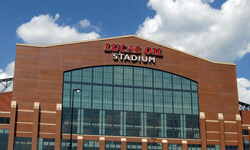 Drum Corps International is excited to present its 2009 World Championships from Indianapolis, Ind., at the brand new Lucas Oil Stadium, and our FANtastic 5 Ticket Packages will give you access to all five Open and World Class events scheduled for Aug. 6 to 8. In order to take advantage of these exclusive ticket packages, your order form must be postmarked by Dec. 1, 2008. So as you get set to head out the door this coming weekend on a post-Thanksgiving Day shopping extravaganza, be sure to drop your FANtastic 5 order form in the mail! Don't forget, single-night World Championship tickets will be released to the public on Wednesday, Dec. 10, so this will be your last chance to "package up" your '09 World Championships experience.